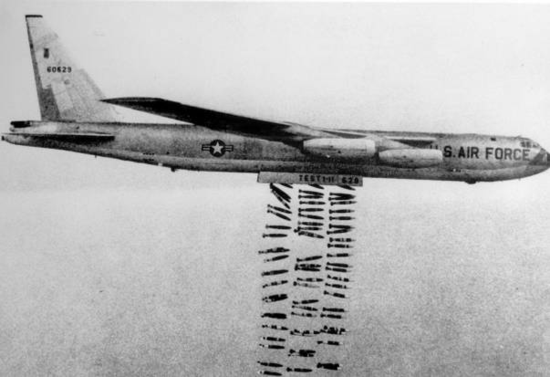 BEAUTY AND THE BOMB | "MASTERS"
Posted on November 8, 2015 by Mark and Sarah - MASTERS! MARK AND SARAH: A big thank you to the many people who kindly commented on our last blog Cabbages and Condoms. According to the online stats and the feedback we have received it was by far the most “well received” blog to date. It was written during a bit of a low period, but thanks to you, our spirits are now fully restored and we’re back in serious traveller mode. Talking of back, Sarah’s is much better (thanks Mags) and now, all’s well with our World. MARK: The overnight sleeper train chugged along at just over 50mph, swaying from side to side. Bangkok was now three hours behind us, Chiang Mai in northern Thailand ten hours ahead. The £4.50 bargain alarm clock bought from Tesco’s showed it was 10.00pm on Monday 2nd November 2015. The journey was uneventful. A means of transport. The toilets were clean, they didn’t smell of wee. The food served wasn’t bad – a bit bland. The bunk beds were clean and relatively comfortable. A cockroach made an appearance, but it was bored and decided pretty quickly to go back to its hole not to be seen again. Demi was pleased! There was no real excitement. It was all a bit flat really. The word flat aptly sums up our two days in Bangkok. We probably should have spent just one night there – like the song said! Flat I guess because we’d been there before and we both realised why we rarely go back to the same place twice. Seen it done it and then move on to somewhere new as boredom soon sets in. This the mantra that best works for us. Deviate and it doesn’t seem to work. 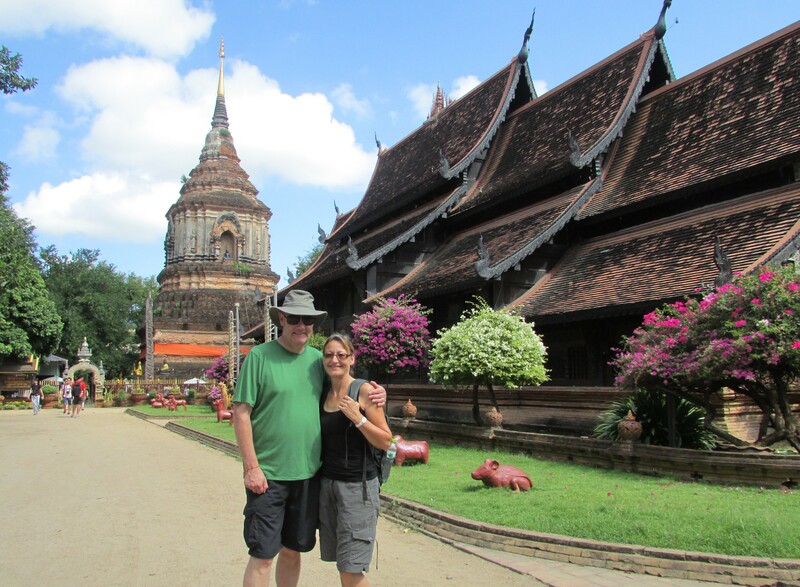 Sadly, things excitement wise didn’t improve much next day in Chiang Mai, the back-packers Mecca, 500 miles north of the capital. Our early morning arrival coincided with a timely and somewhat “spooky” FACEBOOK Messenger note from John Hodson, Reading Supporter and International Swedish Bank Manager. At that precise moment the answer was probably yes. The Chiang Mai market was ok, the park quite nice. The Wat Phra That Doi Suthep Temple was interesting enough, but again it was all a bit samey. If you’ve seen one temple, you haven’t quite seen them all but…. Sorry Barry! So 30 hours later we were glad to move on again, having wondered if we should have been to the Lady Boy show, or learnt what some “ladies” do with ping-pong balls at one of the more seedier night clubs. Perhaps this would have spiced things up a bit. Heading 200 miles further north, in two brand new Toyota mini-busses we travelled to the “Golden Triangle” where Thailand borders Mynamur (Burma) and Laos. 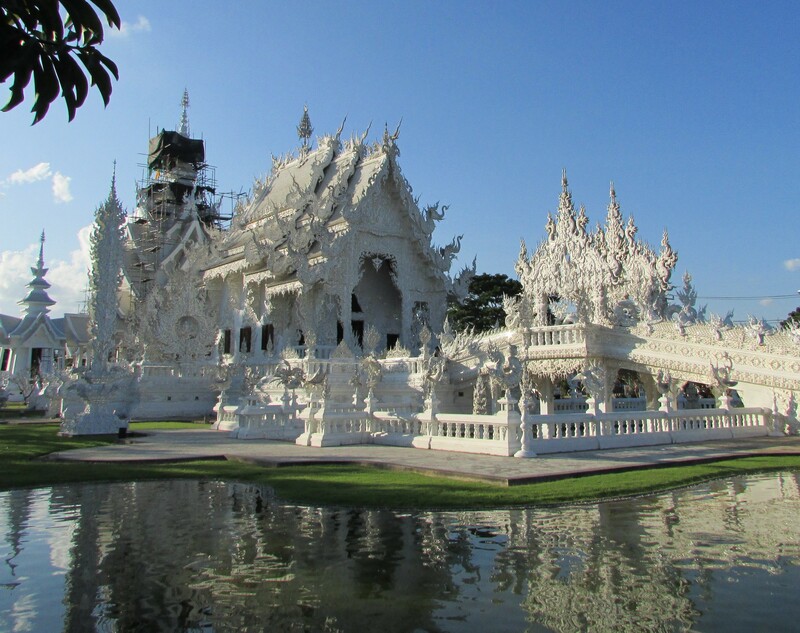 Along the way we stopped at Wat Rong Khun a mind blowing white and silver temple that appears from distance to be made of porcelain. On closer examination, you see that it is made out of whitewash and reflective chips of mirror. Still impressive. In my Trip Advisor report I described it as Disneyland meeting Buddhaland, and indeed most reviews tend to agree that it is magnificent piece of art with religious connotations. I half expected Snow White to appear and walk down the main steps. She didn’t and we continued our journey to Chiang Khong, the light fast disappearing with another stunning sunset visible through the dirty windows. Buddhaland meets Disneyland. Snow White, where are you? And then suddenly at dinner that night, like a switch, the buzz and excitement came flooding back. The Group we are travelling with began to gel. I took part in “who can eat the hottest chilli dish” with Robby a lawyer from New York. Meanwhile the mossies began to bite as we sat high above the Mekong River, with Laos just 500 yards away across the fast flowing moonlight water. With anticipation and excitement, we retired to our jungle lodge bedroom with the thought that tomorrow we would cross the border. First light and Laos, a new country. A new visa and a new passport stamp to add to our growing collection. “Welcome to Laos Mr Mark St John” the border guard said. I hadn’t the heart to tell him St. John was my middle name. We were here and I had my Visa! Mist was rising from the valley floor in the early morning sun, the now 300 yard wide Mekong the only thing to divide Thailand from Laos. A quick transfer in an old van, eight of us in the back and luggage on the roof hanging on with no straps. And then wow the River. Clean air. Stunning beauty. Jagged limestone cliffs. Bright green jungle and vegetation all around. Our boat a three metre wide, 25 metre long, former cargo/fishing vessel that had been decked out with teak tables and what appeared to be seats taken from the inside of a Mitsubishi Shogun. 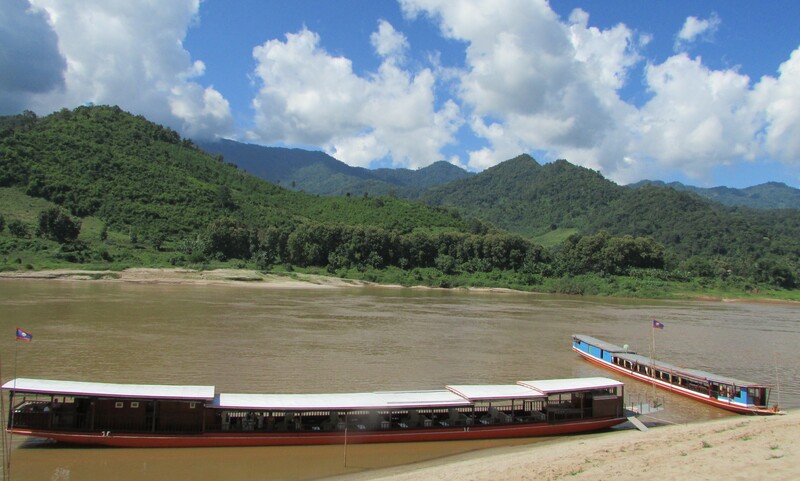 This our new home (during the day) for 48 hours as we were to travel along the snaking Mekong, through stunning gorges, to Luang Prabang the UNESCO protected home of 4,000 Buddhas, 250km downstream. 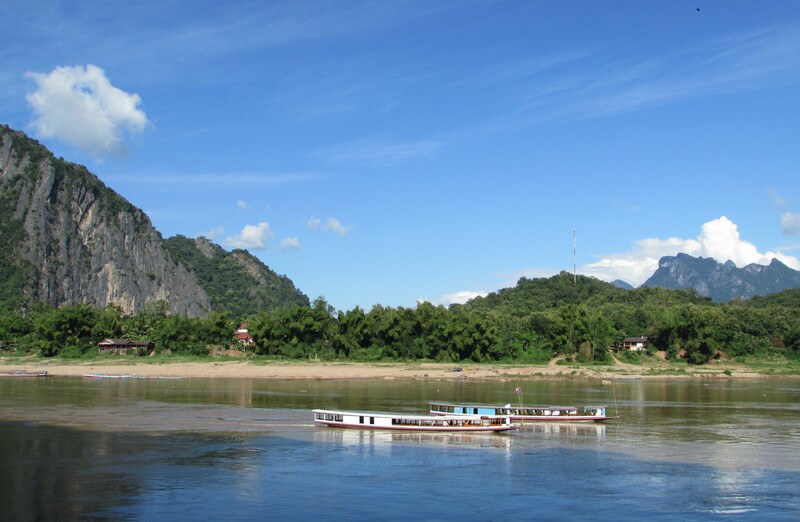 Laos, a landlocked country* (can you name the five countries that borders Laos – see end of blog for answer) is simply stunning in terms of scenery. 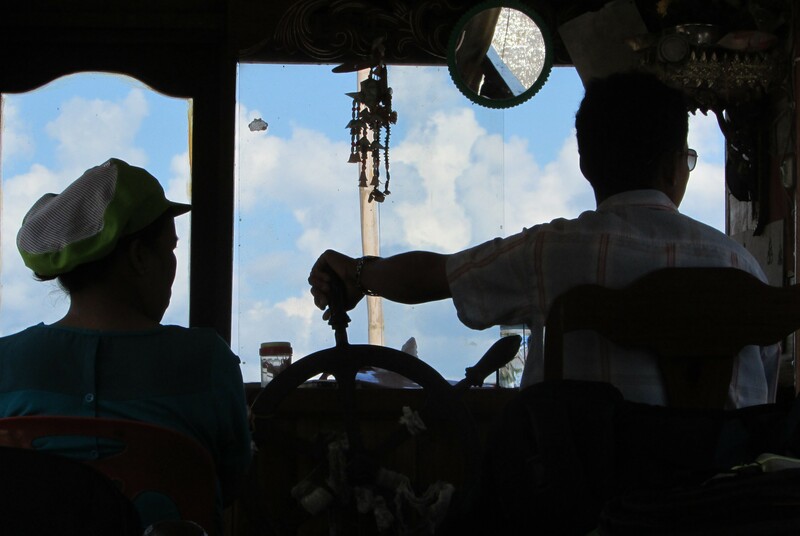 Our leisurely voyage, a cross between sailing down the Nile, the Yangtze and the Rhine whilst floating through a Caribbean island landscape of lush palms, banana plantations and dark green vines that twist and seem to strangle dapple green trees. Four hours in and the front of the boat was beached on beautiful sand near the inside of a wide meander. 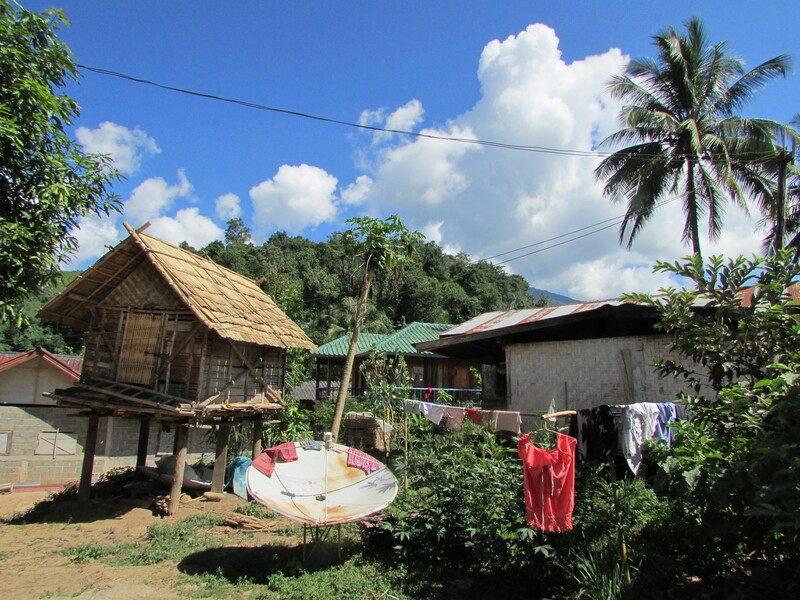 It was our chance to see first-hand a remote jungle village. The village people (no pun intended China Group) had little money except one house that strangely sported a big sat’ dish. The rest, built on stilts, were basic with largely dried mud floors. But, the children smiled. They were loved and cared for. They were clearly happy. We were happy. Back on the boat and a couple of cool cans of Laos beer went down all too easily. 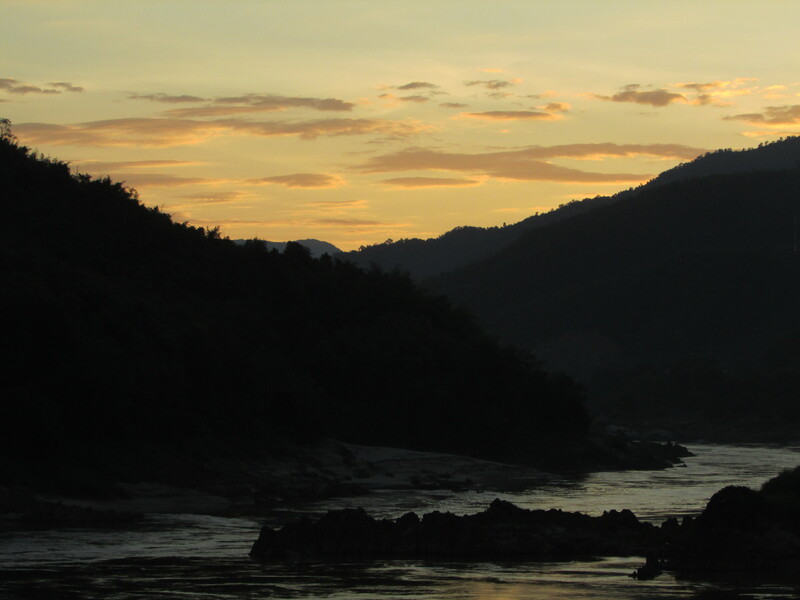 As 6.00pm approached the sun disappeared behind the mountains as our group of 15 arrived at the Mekong Jungle Lodge for our overnight stay. 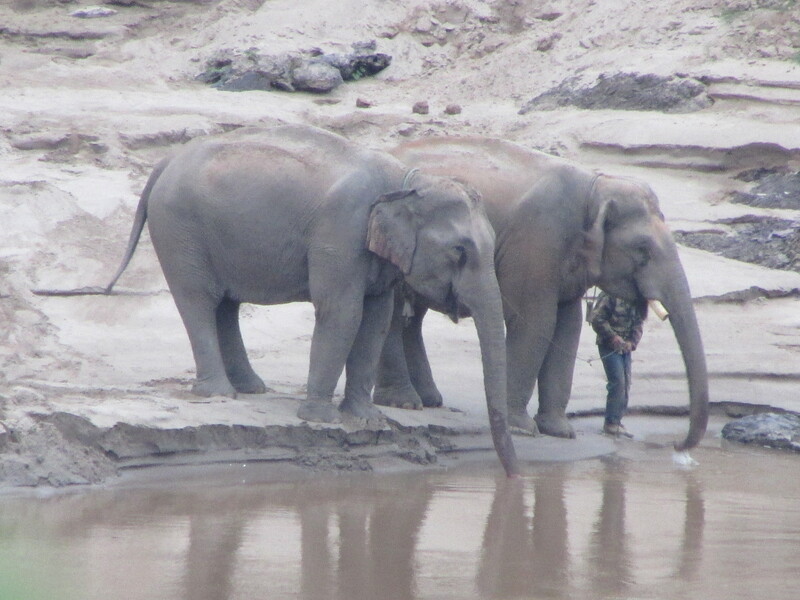 Memorable views in the evening and then again next morning as elephants bathed on the far banks of the river. Could this be Paradise? Then bang. My mind switched as I read an online article. I knew the people of Laos were “victims” of the Vietnam War which ended 40 years ago. But I didn’t fully realise what that still meant in 2015. This country of beauty has the distinction of being the world’s most heavily bombed nation. During the War, over half a million American bombing missions dropped more than 2 million tons of ordnance on this small country. That’s the equivalent of one planeload every 8 minutes, 24 hours a day, for 9 years. In the last ten years only 1 million bombs have been destroyed with over 20,000 deaths and serious injuries since the end of the war. Brendan, a really nice American guy on our tour commented that it wasn’t America’s finest hour. Indiscriminate bombing that killed thousands and still does to this day. What a legacy. I could go on…. I won’t because this trip is about the here and now. But, digging a little deeper beneath the surface reveals what travel for me is all about. A random mix of history, geography and biology – ‘A’ Level text now finally coming alive and real. A unique experience. In this particular case a heady cocktail of beauty and the bomb literally living side by side. As we continue or journey through Indo-China, this will doubtless be a recurring theme in Vietnam and Cambodia. History from my lifetime which I sadly remember. But for now I want to remember the beauty. 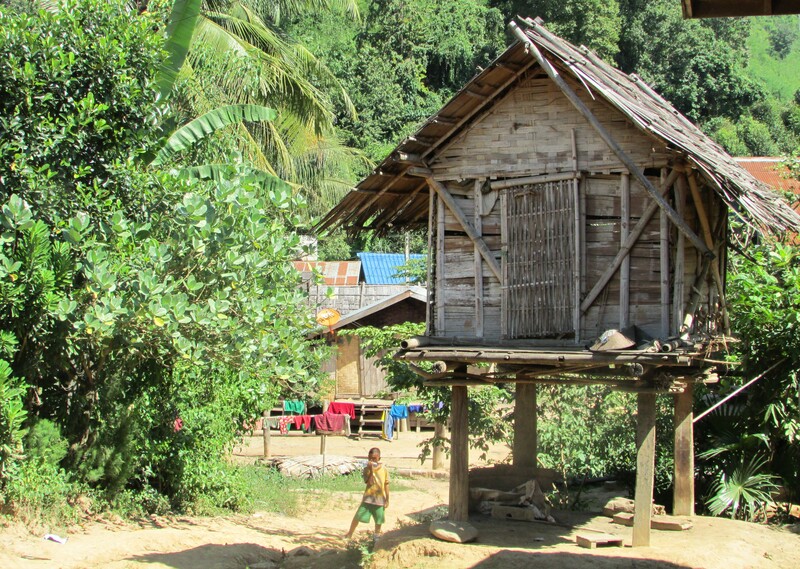 Flat no more, Laos has indelibly burnt itself in to our memory. 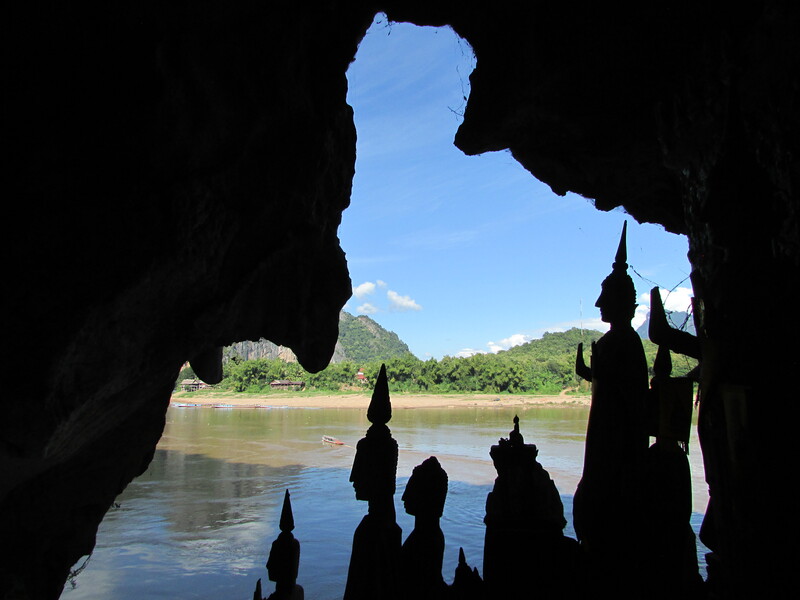 *OF COURSE YOU KNEW – LAOS is bordered by China, Burma, Cambodia, Thailand and Vietnam. Give yourself five house points if you got all five countries. Hello Mark and Sarah! So happy that you are back enjoying yourselves and feeling positive about the next part of the trip. Another great piece of writing mark. I feel like I’m learning things I was unaware of which has to be a good thing. The legacy of war leaves scars for all. My grandfather fought in Burma and was so traumatised that he had to sleep with the bedroom light on for the rest of his life. It affected his relationships with other people and sadly ended his marriage. No counselling or support offered in those days. These young men saw things that no one should ever see. On a more cheerful note……Christmas is in the air and all the shops are full of overpriced and unnecessary tut. Who buys all this rubbish???? It’s madness. I know that sarah will be missing the shopping but I promise you that it will still be there for you this time next year! What a horrible thought! Ho Ho Ho…. no Christmas lights here yet, unsurprisingly. Thanks for your comments and the note about your grandfather – very, very sad. In war there are no winners just innocent locals. Wonderful description of Laos. Shuddering to think what happened during the Vietnam War. A religious centre in the north east – Xieng Khone – was completely destroyed by the Americans. According to one American officer it was “destroyed to protect it”. 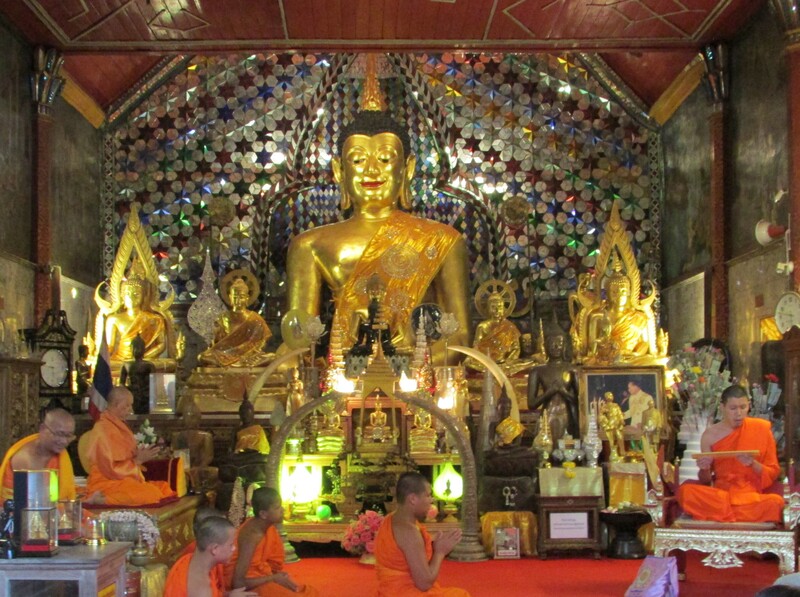 You will have seen our favourite building in the world in Luang Prabang – Wat Xieng Monastery, serenely beautiful. Agree the Mekong is stunning. Also, did you notice how beautiful the people are? Your descriptions are wonderful. Keep them coming. Glad to know your down time has disappeared. Lest we forget, what you are doing is as Malcolm says awesome, but is no doubt both physically and mentally exhausting so probably only natural that a few home thoughts creep in when it becomes a little over whelming. Times of war obviously very much to the fore in Chapel this morning. Who cannot fail to be moved by the sight of parents’ laying wreaths at the foot of their children’s memoriums, young lives lost on the Afghan campaign. Hard so hard. On a happier note, just loving the pics and the video. I feel as if I am there with you and all via technology. Wonderful! Thanks Ian for your insightful as always comments…. war and conflict, mixed with beauty and tourism DOES seem to be a theme that is following us/we are following…in most cases there is light at the end of the tunnel after the event. But us humans rarely seem to learn from history…. 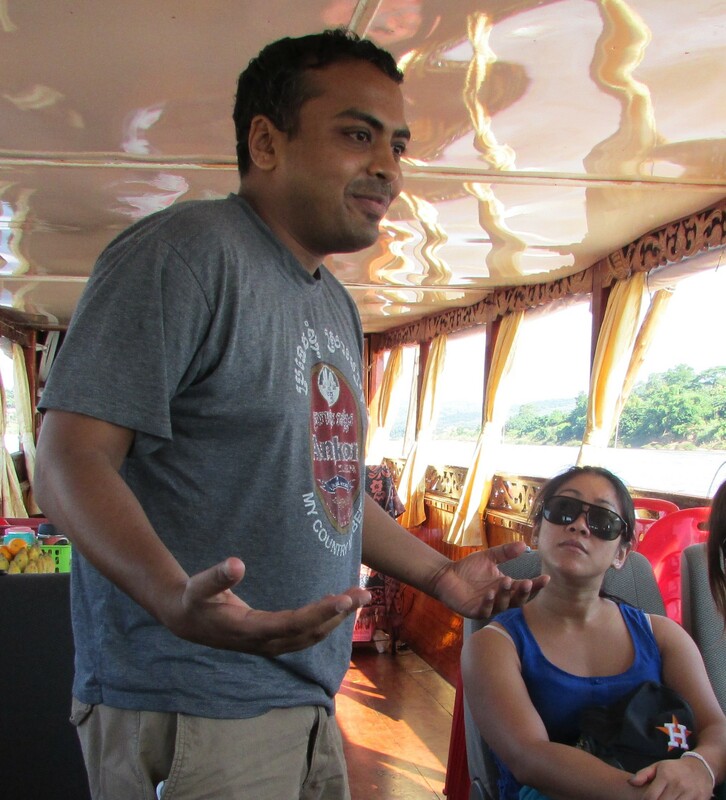 Vietnam and Cambodia will be a further “test” of our emotions…. best wishes and thanks for writing. Green Ghost. Thanks Malcolm – lest we forget!! !